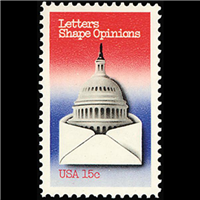 Send your partner an envelope containing your favorite unused postage stamps issued in the USA. Minimum of $1.50 in postage value (can be various different ones of any value, I usually send around 10 different stamps), but feel free to send more! Can be vintage or newer issues (2018, etc. ), just send whatever you like.